Why did you not post the scout tank one here? There is some excellent learning in that vid. This is a match on how to keep your cool in tough situations. Everyone like me? Too busy to tank? Or just no one having any good games? MY best damage games are riding on the tails of squeaker losses. 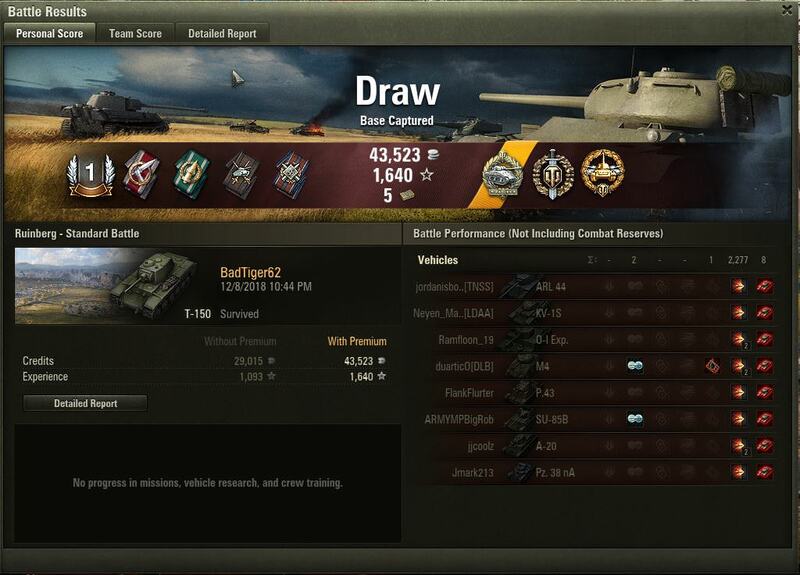 1611 damage in the Bishop, 4 kills, some madman on the other side of the map, pinging away and then chats, "Arty feel free to fire any time." So I respond, "You're out of range smart a$$." This in the same match where I am the only one on Karelia doing damage in the valley side while someone repeatedly pings my location and the location where I am already doing damage. I have been having a tough time keeping my cool the last few days. That match I came away with a High Caliber while dealing with folks who simply camped their positions while pinging for help or who kept pinging locations that I was the only one doing damage at in the first place -- all while indicating I should DO SOMETHING. Most frustrating at 8 fps to try to explain that I AM the ONLY ONE doing something at the moment. It's been like this for the last few days and now my "Q" and "I" keys are also on the fritz more often than not. Also, on Erlenburg I once again accidentally hit the "F" key and backed off into the that stupid river with no way to get out of it and drowned. That was totally my fault, however it does not lessen the frustration factor. 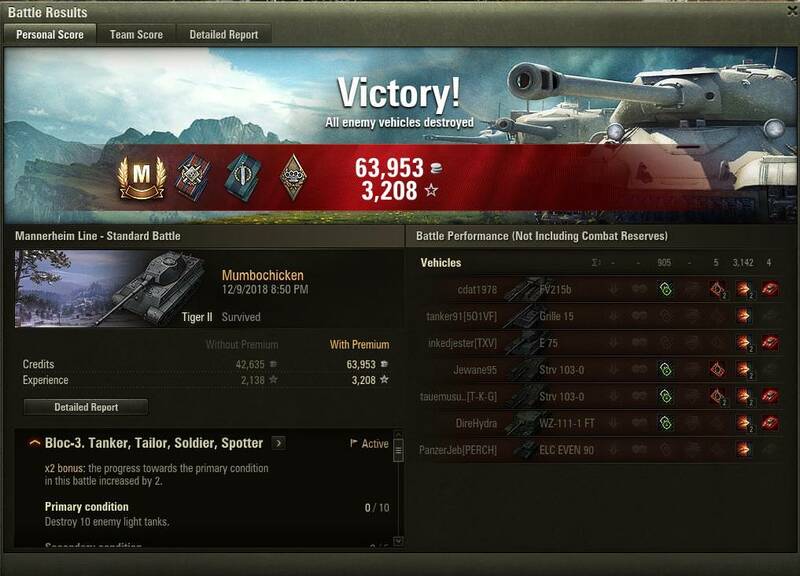 Fortunately I had already done 1172 HP of damage and 3 kills in the Grille before that happened and we were winning, so... not as bad. It's been days and days like this. My highest damage games are on losses where the rest of the team folds up like a cheap card table. And there have been a LOT of those. On Himmelsdorf, T1 Heavy. I realize the hill is where most of their team is and there are few if any on the ground floor. In order to provide a flanking distraction, I go up the backside to attack from the rear and run into the TOG II. At 1400 HP, it's a beast, but it was alone and there was a Jackson who followed me -- up until the last moment. I really thought we'd be two going into the rear of their hill force. 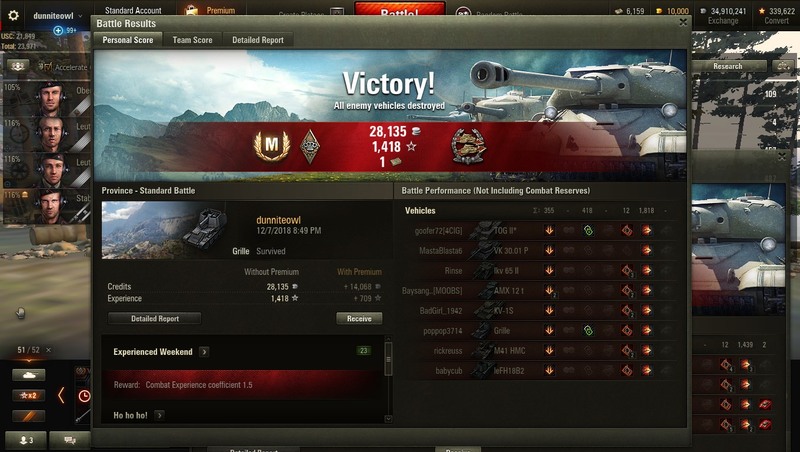 I took out 786 HP of the TOG II before 2 more of their back units responded. We did the dance for about two minutes before they wore me down and I just could not extricate, much as I wanted to. The TOG II was actually so big it kept me from getting back around to my exit point, just from sheer size. Like I said earlier, no matter which unit, which map, which tier, I have just been making the worst calls overall and cannot seem to get over it. I can deal with my technical limits, but something crazy is going on and I do not seem to be able to pin it down so that I can adapt to it. Grrr! Yeah I am hearing this a LOT. Hang in there Dun. Well i haven't made someone this mad in a long time so i guess i can consider it an accomplishment. TL R, Enemies T95 got caught up against 5 of us, i got behind him and prevented him from retreating while we all whittled his health down to nothing. After the battle, i got this wonderful message from him in the garage. I have since then reported it to support and he will most likely not be talking in team chat anytime soon, but who knows. Kids, beware. If you're in a T95 and i'm in a E-50 and i can get behind you, that booty is mine. Wherein I managed to get one of my favorite Pixel Badge Awards, the Confederate. Oh, and an Ace Mastery, too! So, now, I can weather another 40 or so crappy games before I lose my cool factor again. Toodles! And, another Oh Yeah, I managed to hit each of their arty, too. Which is nice because their 41 HMC blind fired me and almost took me out in the first four minutes of the game. Edited by dunniteowl, Dec 08 2018 - 04:06. Still grinding the horrendous marathon..
Battle achievements: High Caliber, Confederate, Mastery Badge: "Ace Tanker"
So 12-7 was a good day for me in the Russian T-150 killing 8 enemy vehicles and receiving a Top Gun award (my first),Reaper, Master Gunner, Duelist, Fire for Effect, High Caliber, and Radley-Walters Medal. I tried to post an image but could not. If any one has a good free image hosting site that this forum likes would you please pass it on. The very next battle I died miserably. I really want to thank all the tankers who helped me out in these forums and on you-tube. 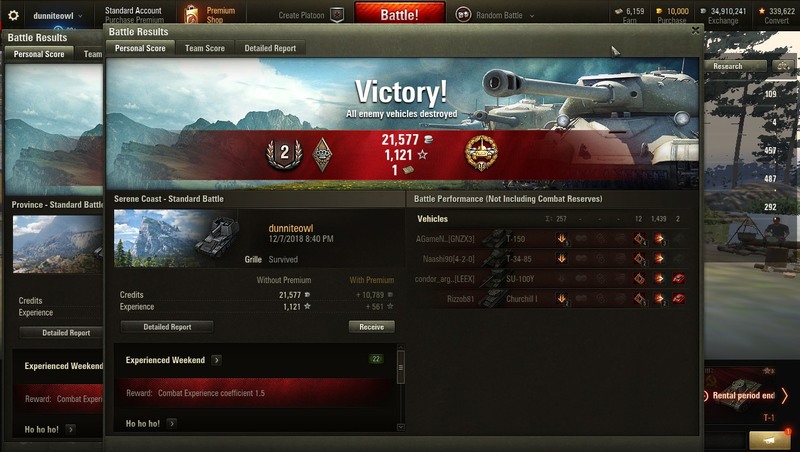 It really does help your game even if fighting two tiers up can be very frustrating and there are days your team gets slaughtered 3-15 - the game can be fun. There are some frustrating issues I would like to see resolved. Having a small portion of your track showing and you take a hit that your entire vehicle is destroyed is a PITA. Fighting two tiers up for noobs like me is super frustrating. I really wish there was a server just for people with 6 or less months in game with only one tier up or down to fight. This might alleviate some frustration and help people learn. It might also cut down on the number of texts you get from angry players calling you a noob and learn to play or leave. LOL, I have had my fair share of those. I have given up on my Victory % and really concentrating on my accuracy. I have gone from low 40s to almost 60% hit ration now. Thanks in part to a few people in the forums. Anyway, the game is frustratingly fun and I hope to get into my next tank soon - grinding out the experience which never seems to come quickly. One mistake the game designers made, imho, is not allowing premium (purchased) tanks from moving up the tech tree. Even though the player bought the tank, it still should be on the tech tree - even if the cost were slightly higher at least the player could work toward a higher tank rather than just training his or her crew. Just a thought - file it where thoughts usually go. the original BADTiger (BAD = Brave and Daring) from my early days as a virtual pilot in the BAD-ACES Squadron on WW2OL. Shout out to any mates who ruled the skies with me in that squadron! Edited by BadTiger62, Dec 10 2018 - 03:21. Recently started playing again and been grinding the Tiger II. Took a little while to get used to the game again but had a few good games tonight. Almost finished with this tank. Good games Mumbo and BadT! Great games fellas, keep them coming! 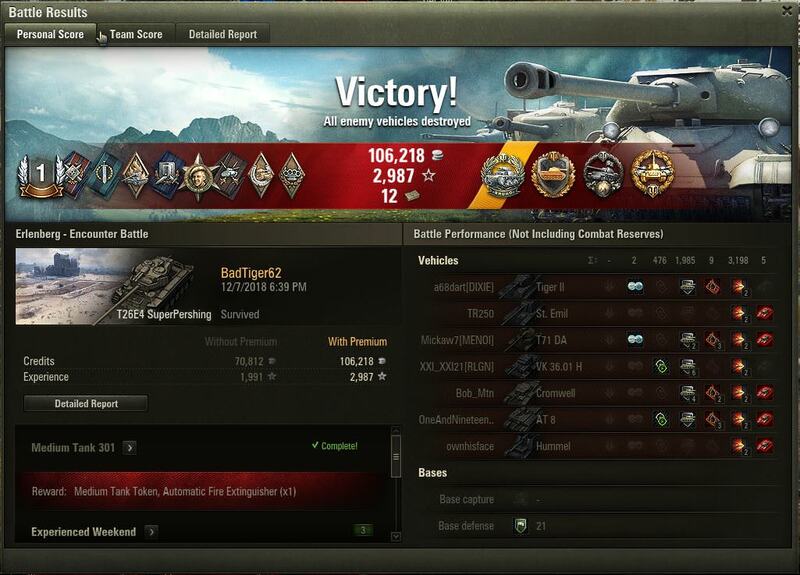 Not my highest spotting damage game ever but I think it's my highest in a medium, I believe I had a total of 82 hp of track damage, the rest was spotting.